After earning his Wings of Gold in early 1942, Ensign McWhorter was trained as a fighter pilot in the robust but technologically outmoded F4F Wildcat. Initially assigned to VF-9—a fiercely spirited and hard-playing fighter squadron—he saw first combat in November 1942 against Vichy French forces in North Africa. Subsequent to returning to the United States, VF-9 became the first unit to convert to the new Grumman F6F Hellcat fighter—the fighter the U.S. Navy would use to crush Japanese air power during the long offensive from the Southwest Pacific to the shores of Japan. From mid 1943, Hamilton McWhorter was constantly engaged in the unforgiving and deadly aerial warfare that characterized the battles against Imperial Japan. 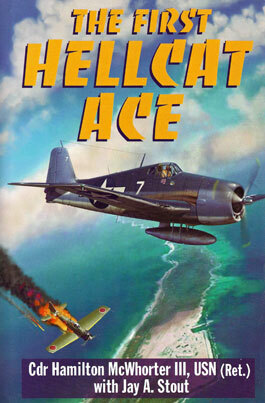 His fifth aerial victory, in November 1943 off Tarawa Atoll, made him the first ace in the Hellcat, and seven subsequent victories ensured his place in the annals of air-to-air combat. McWhorter’s combat service, from the beginning of the war to the last campaign off the shores of Okinawa, makes his story a must-read for the serious student of the Pacific air war.